Sharon Lockhart, Podwórka, 2009. 16 mm transferred to HD. 29 minutes. Bonniers Konsthall is proud to present the first large-scale solo exhibition in Scandinavia of American artist Sharon Lockhart. For the past two decades, Lockhart has portrayed individuals and their communities, showing aspects of their everyday lives in moving and still photography. She belongs to a generation of artists who, during the 1990s, turned their attention to the everyday, to the subjective, the human. Lockhart is also an artist who draws inspiration from the filmic and, in turn, her work has had a great impact on the development of film as a means of expression in the visual arts. Borrowing working methodology from documentary photography and film, as well as ethnology and anthropology, Lockhart combines these aspects with a distinct, minimalist aesthetic. Lockhart’s work inhabits the middle ground between the photographic and the filmic, and emphasises the relationship both maintain to time and space. Her photographs are meticulously staged, as if they were frozen, documentary theatre pieces, while the slower pace maintained in her films remind one of still photography. Sharon Lockhart’s artistic working methods have influenced many of her contemporary colleagues – Swedish counterparts include acclaimed artists such as Ann-Sofi Sidén, Johanna Billing and Annika Eriksson. In her practice, Lockhart often illuminates the forgotten and the overlooked. Her working process involves long periods of research in a given location, where she familiarizes herself with the local community, often forging deep friendships and initiating a strong collaboration. She has worked together with factory workers in Maine, a female clam digger in a male-dominated profession, Japanese schoolgirls, and children living in former Eastern-block Łódź, Poland. Her meticulous fieldwork is then transformed into poetic tableaux of still and moving imagery. Sharon Lockhart, Double Tide, 2009. 16 mm transferred to HD. 96 min. Milena, Milena is the second exhibition in a trilogy based on Lockhart’s portrait of Polish teenager Milena – a story about the difficulty of leaving childhood behind and facing adulthood. Sharon Lockhart first met Milena in 2009 in Łódź, Poland, while filming Podwórka. 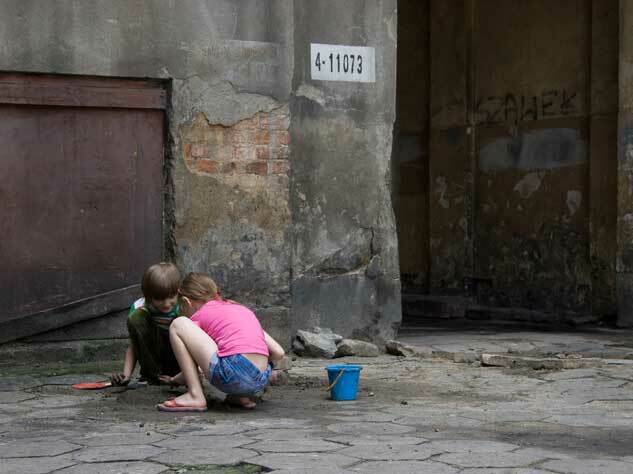 Literally translated as ‘courtyard’ from Polish, Podwórka displays six different courtyards in Łódź and the children that live and play there. It was in one of these courtyards where Lockhart met and befriended then nine-year-old Milena. Lockhart gravitated towards Milena’s strong personality, and the two soon developed a friendship through the act of play. When Lockhart was invited to stage an exhibition in Warsaw a few years later, she rekindled her friendship with Milena, and discovered Milena’s profound desire to write an autobiography about her life. Triggering an on-going collaboration between Lockhart and Milena, the imagined autobiography has been the impetus through which the two have explored artistic expression together. This exhibition at Bonniers Konsthall features a specially commissioned, monumental stained glass portrait of Milena. The image captures Milena’s face, illuminated by a sparkler held in one hand, as she playfully spells out the letters of her name against the black backdrop of the night sky. The genesis for this piece was derived in part from Lockhart and Milena’s participation in a stained glass workshop in rural Poland. The piece connects an intimate moment to Poland’s rich cultural tradition of stained glass, a common, familiar and iconic art form that adorns the countless churches throughout the country’s landscape. The idea for the piece was born out of a desire to create a tribute to Milena that is both personal and deeply rooted in Polish history and tradition. For the construction of this work, Lockhart enlisted master Polish glass painter Piotr Ostrowski, who interpreted the artist’s snapshots of Milena using 14th century glass-making techniques. A driving force for the project has been the theoretical writing of Polish-Jewish educator, children’s author and pediatrician Janusz Korczak (1878–1942), which Lockhart will include in the exhibition with a conceptual display of How to Love a Child in Braille. A legend of his own time, Korczak experimented with the methods of institutional education, based on the developmental enhancement of a child’s inborn abilities. representative of the social pedagogy approach and a pioneer of children’s rights, he envisioned a future in which children structured their own world and became experts in their own matters. He crystallised his knowledge of child psychology, while learning to “(speak) not to the children but with the children”. Milena, Milena was curated by Polish curator Adam Budak, along with Bonniers Konsthall’s Camilla Larsson, following Budak’s curation of the first iteration of the exhibition at the CCA Warsaw. The exhibition tripdyche Milena, Milena includes a series of strategically selected identifications that claim the biographical dimension of Sharon Lockhart’s oeuvre. Thus the three exhibitions operate as actual portraits as well as projections. As such, the exhibition is framed by two works of a strong biographical component: it opens with the cinematic Double Tide (2009)—filmed in Maine, USA, where Lockhart spent her childhood—and concludes with the rarely exhibited series Untitled Studies (1993–ongoing), Lockhart’s photographic diary, composed of re-photographed snapshots found in her own family album. At the center of the exhibition’s narrative is Milena, an enigmatic figure who remains disquietly absent, distilling the different threads of identification in her very non-presence. The third installation of Milena, Milena will be shown in early 2015 at Kunstmuseum Luzern in Switzerland. The exhibition architecture is created by Sharon Lockhart’s long-term collaborators, Los Angeles-based architectural firm Escher GuneWardena. A catalogue, published by Silvana Editoriale, will accompany the exhibition. With support from the Polish Institute, Stockholm.